Comin at yah with another review, I’m trying to crank these out at the rate of one per day until I’ve caught up on all the ones I have to write. This time I’ll be reviewing the Jaco Van Dormael’s trippy Mr. Nobody. This one was Liz’s pick but I’m glad she picked it because I wanted to watch it just as badly as she did. It was an odd movie but I mean that positively. 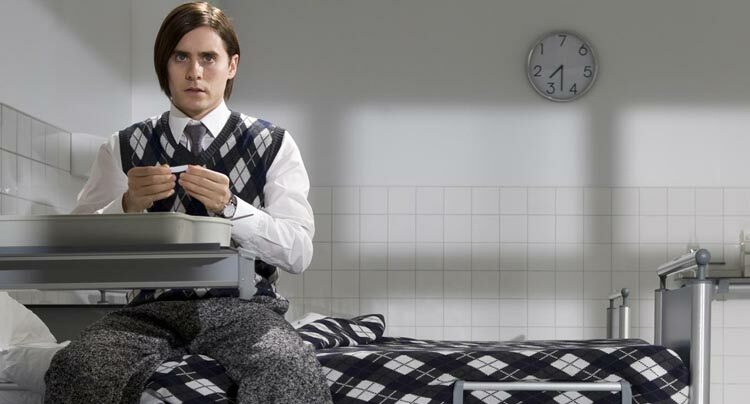 Mr. Nobody was both written and directed by by Belgian director Jaco Van Dormael and star Jared Ledo in the lead role of Nemo Nobody. I’ll try to give you a brief outline of what the film is about but I can’t promise I’ll be very successful as this movie does not progress linearly and makes it a bit difficult to keep track of everything. Essentially this movie revolves around Nemo Nobody at different stages in life and in different planes of existence. It is said that before birth children remember everything that WILL happen (aka their futures). Before being born they pick their parents and then special angels press a finger to their lips and the child instantly forgets everything. For some reason Nemo was forgotten by the angels and when he starts life he can see into all his possible futures. All is fine and dandy until 9 year old Nemo is faced with the reality that his parents are divorcing. On the day that his mother is boarding a train to leave and start her new life, Nemo is forced by his parents to decide who he wants to live with and who he wants to leave behind. Why they would leave this decision to the very last second or why they would leave this decision to a nine-year old is beyond me but people be crazy so we’ll roll with it. At that moment the story splits into a ton of different places in which we see where Nemo’s life can go depending on what decisions he makes (starting with which parent he chooses to live with). I’ll leave it here because I don’t want to spoil anything but there is much more to the story. I usually write notes while watching movies I know I’m going to review but on this particular day I was tired and bitter about the fact that Liz and I couldn’t find a single donut shop that was still open so I didn’t take notes. I’m trying to remember as much as I can. If my memory is true, I took issue with the film on the primary grounds that the story was much too choppy and confusing. I have nothing against intricate movies or movies that make you really think or even do a little research to understand them but this was a different case for me. The story was awesome in that it was structured to show just how different life can be depending on what choices we make. The fact that it has to portray so many drastically different lives explains much of the choppiness but the jumping back and forth between stories and some of the random events that happened or things that were said too often had me going, “wait what just happened?” Immediately after finishing the movie I told Liz that I didn’t think I liked it much. I really don’t think I was in the best frame of mind to be watching this movie because after doing a little research for clarification on what had happened in the film I did end up appreciating it more. I also think that this is one of those movies that needs multiple viewings to fully appreciate. Regardless, this review stands as is based on my single viewing. Now that I’ve gotten my main complaint out of the way I can get to some of the stuff I liked about the movie. While I did think the story could have been executed much better, I do appreciate what the story was trying to do as a whole because it is quite the ambitious project and certainly got me thinking. The end reveal that SPOILER: the entire movie was just playing out in Nemo’s nine-year-old mind and that the old Nemo, the future society of quasi-immortals, etc. were just figments of the imagination of nine-year-old Nemo was truly thought-provoking and well done. Another aspect of the film I enjoyed was the cinematography. The makers of the film decided to use really bright colors and interesting patterns throughout the film and there were really tangible differences in style between the various lives Nemo lives. It was interesting to see these differences developed and I appreciated the detail given to each one. The acting was also good in this movie. Jared Leto has proven time and again to be a very versatile actor and I love how varied his role choices are. This wasn’t his flashiest or best role but he did a nice job in the role of Nemo and conveying different emotions depending on which Nemo he was at the time. The soundtrack to this movie was great as well. The song choices as well as the original stuff put together for this film fit the mood of the film perfectly and was one of the stronger aspects of the film. In the end I gave this movie lower score because it had a great idea that really lost focus a few too many times for me. It was complex but complex in a way that I didn’t make me feel all that inclined to unravel what it was trying to say when I couldn’t figure it out on my own. I did end up re-reading some details about the film to write this review and I remembered that I appreciated the movie more in the grand scheme of things. The score would be even lower if I had written it closer to the date when I watched the movie. At about an 2 hours and 30 minutes in length this movie also felt like it dragged on longer than it had to. This is especially true in the many instances when the movie loses its focus. I would say this one is worth a watch if you’re into more philosophical movies and the multiple-worlds theory of life. Plus its on Netflix.